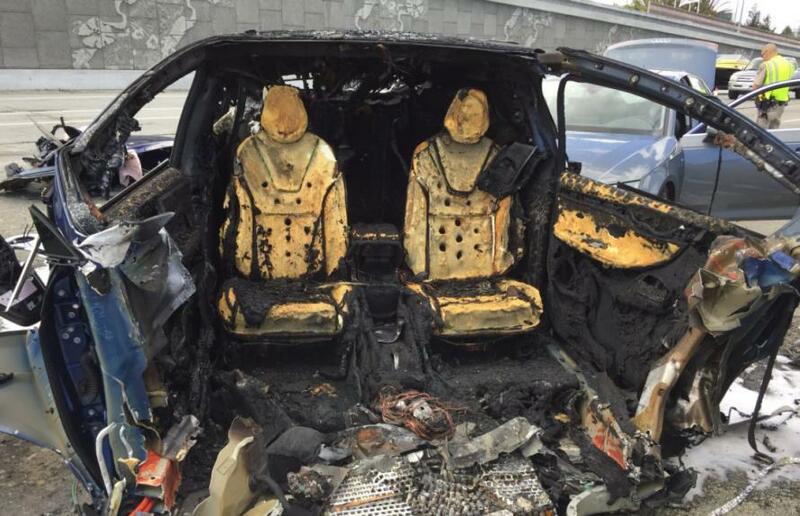 Last October, we reported that in the latest, at the time, conflagration involving a Tesla car bursting into flames after its batteries exploded, a Model S burned to a crisp after an accident on an Austrian highway. The car's 19-year-old female driver had entered a construction zone on the highway, and when she tried to shift from the local to the fast lane, the car lost control and hit the concrete divider wall along the side of the road. A moment later the electric car burst into flames. It was unclear if the autopilot was involved in the crash, but the the good news was that the driver survived the dramatic crash unscathed. Unfortunately, in a similar crash on Friday in California, the driver was not so lucky. 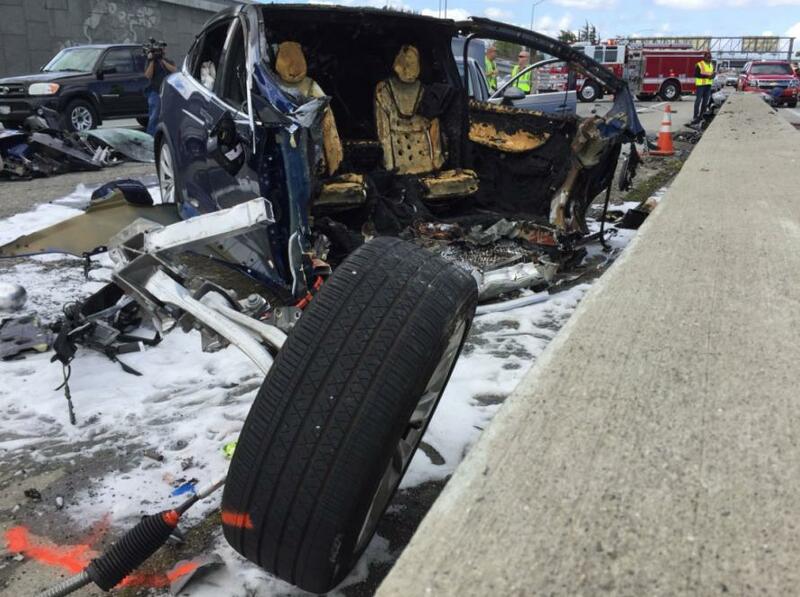 Driving on Highway 101 near Mountain View, California, a Tesla Model X suffered a gruesome crash when the vehicle hit a carpool lane barrier, leading two more cars to crashing into it, and causing the lithium ion batteries powering the vehicle to ignite and explode, at which point the vehicle burst into flames. The blue Tesla was driving southbound on Highway 101 at freeway speeds near Highway 85, when it collided with a barrier separating the carpool lanes on both roads and caught fire. The burning car was then hit by a Mazda and an Audi. The driver of the Tesla was then taken to Stanford hospital. Tragically, the California Highway Patrol announced later on Friday that the driver had died from his injuries. According to a timeline of occurrences, the cause of death appears that the driver was "trapped" inside the burning car. Images from the scene showed the front of the Tesla completely destroyed as firefighters tried to get the fire out. Crews were still on the scene cleaning up as of noon. Police told the local NBC affiliate that the car's battery may have been involved in the explosion: "We're used to regular vehicles, now that we have the batteries in these vehicles, we don’t know what’s in them so we're learning as we go," said CHP officer Art Montiel. As they responded to the scene, officers were wary of the batteries. They called for backup before approaching the car, which may also have been the reason why the "trapped" passenger died inside the burning Model X. A "Good Samaritan" who was riding his motorcycle down highway 101 (and who asked NBC to remain anonymous) shared what he saw at the scene of crash exclusively to NBC Bay Area after heading over to help. "I saw, past the smoke of the smoldering and sputtering Tesla Model X and saw a man running up with a fire extinguisher," said the Good Samaritan. "I rounded towards what used to be the front of the car and saw, remarkably, an intact man that was covered in a light layer of dust. The front of the car was simply gone." "We brought him what we hoped was a safe distance from the wreck, hoping the LiPo batteries weren’t prone to exploding," said the Good Samaritan. "Another man placed the victim in the recovery position." Footage from the crash shows smoke and flames emanating from the vehicle. Tesla sent an employee over to investigate the crash and the subsequent fire. An exposed battery was visible inside the car. Meanwhile, officials are investigating what caused the Tesla to catch fire. It remains unclear if the car's autopilot was engaged when it slammed into the carpool lane divider, resulting in the driver's death.